New Halqa Bandi In Sindh 2018 For MNA, MPA Seats displayed here from NA-196 to NA-256. It starts from Jacobabad and ends till Karachi Central-IV. These constituencies are unlimited support to retain the information about the constituencies reforms in the best way.Shikarpur Taluka excluding Tapedar Circle of Shikarpur includes the NA-198 Shikarpur-1. 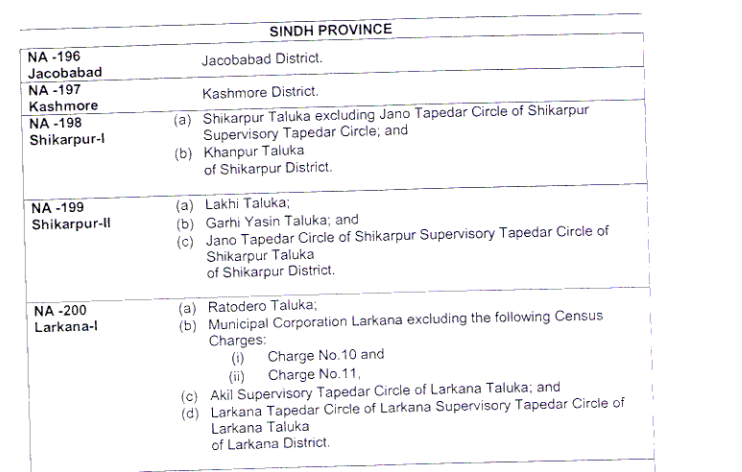 The Khanpur Taluka of Shikarpur district included in the same constituency of National assembly. NA-199 Shikarpur-II includes the Lakhi Taluka, Garhi Yasin Taluka. Na-200 includes Larkana and adjacent areas. NA-256 Karachi central IV, NA-255 Karachi central III are some of the areas going to considered according to the realistic approach. PS-1 to PS-130 are constituencies named as and the Nazimabad with respect to the sub divisional approach. The division is beauty of general elections of Pakistan 2018. Further division about the New halqa bandi in Sindh 2018 For MNA Seats make it more relevant to the area distribution. In best way it is going to declare as per the New halqa bandi in Sindh 2018 For MPA seats. The ECP rules are fully followed here in this division.